Although my birthday is at the beginning of the month, even I have to admit January is the worst. I had the most incredible birthday weekend and naturally I extend the celebrations across the entire month (lol) but even then, it’s not a pleasant month. Christmas and New Year celebrations are a distant memory, it’s still cold, it’s still dark and payday seems to be both a distant memory and too far away. There’s actually nothing to look forward to. Bleak. My natural instinct is to either hibernate or indulge in some retail therapy. Given the current obsession with hygge, the first choice might be the more obvious way to go but you just deny the appeal of feeling better and having a new dress to brighten your mood. The only problem is: January = broke. The sales are great but super stressful, I avoid Oxford Street at all costs and only really indulge in some online shopping but nothing beats being able to peruse the rails, feel the fabrics and try everything on before heading home with purchases you’re totally happy with. There’s nothing more heart-breaking than receiving a huge ASOS order and returning the entire box of ill-fitting goodies. On my quest for some retail therapy, I hopped over to Wembley Park this weekend to check out London Designer Outlet (LDO). I did consider heading to Bicester Village…but that requires committing an entire day to shopping and venturing out to deepest, darkest Oxford whereas I just hopped on the Jubilee line to LDO. 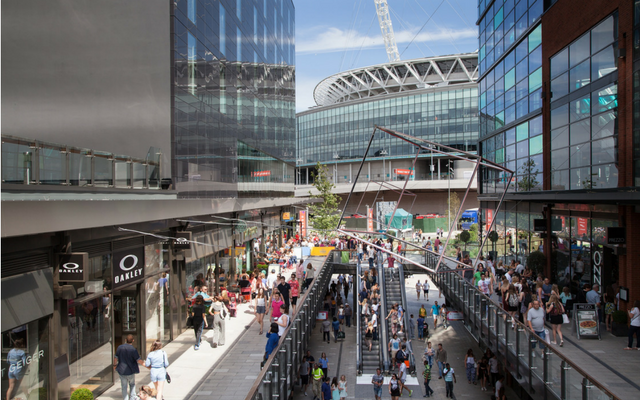 The shopping centre is right by Wembley stadium and full of your high street faves, from Kurt Geiger and Sunglass Hut to Jack Wills and Adidas. In fact, there are 50 brands selling their good at up to 70% off with 20 restaurants and bars to refuel in between all that retail therapy. I might have indulged in a little retail therapy with my boyfriend, which happily didn’t dent either of our wallets. My bank manager must be breathing a sigh of relief! Although we spent a long time checking out pretty much every store, we spent the most time in Jack Wills stocking up on some great basics. There was an arctic chill in the air so we naturally got a couple of jumpers each, I found an incredible ice white faux fur hat, some cosy loungewear and a green plaid shirt that is definitely going to cause a few arguments – I maintain that it looks better on me worn oversized but my boyfriend is sticking with his “But it’s a men’s shirt…” stance. You’re extremely likely to see me wearing it in a couple of months with studded boots, bedhead and a bold red lip. Thankfully, LDO also has a cinema and tons of restaurants and bars – exactly what you need after that exhausting retail therapy, I mean cardio. We went to Sugar Dumplin for dinner, seduced by the cosy cabanas and authentic menu. My boyfriend opted for the buttermilk fried jerk chicken with rice n peas, which smelt incredible, while I went for the delicious butternut squash and chickpea creole curry which was so yum! It was so good to taste some spicy Caribbean flavours, washed down with a little Wray & Nephew – the perfect antidote to a dreary January. Visit the London Designer Outlet website for more information on shops, restaurants, opening times and directions.